Our Associate’s Degree Program began in 2013 in collaboration with Holy Apostles College. Students in this unique program may earn up to 75 college credits, from home, by the conclusion of 12th grade, as the first three students to complete the program did by May, 2017, then completing their accredited BA degrees one year later in May, 2018 (w/15 Holy Apostles College online credits each in the subsequent Summer, Fall and Spring semesters). More students are following in their footsteps each succeeding year. The cost for this four-year program (through 12th grade) began at $325 per month for 46 payments (=c.$15,000 total). 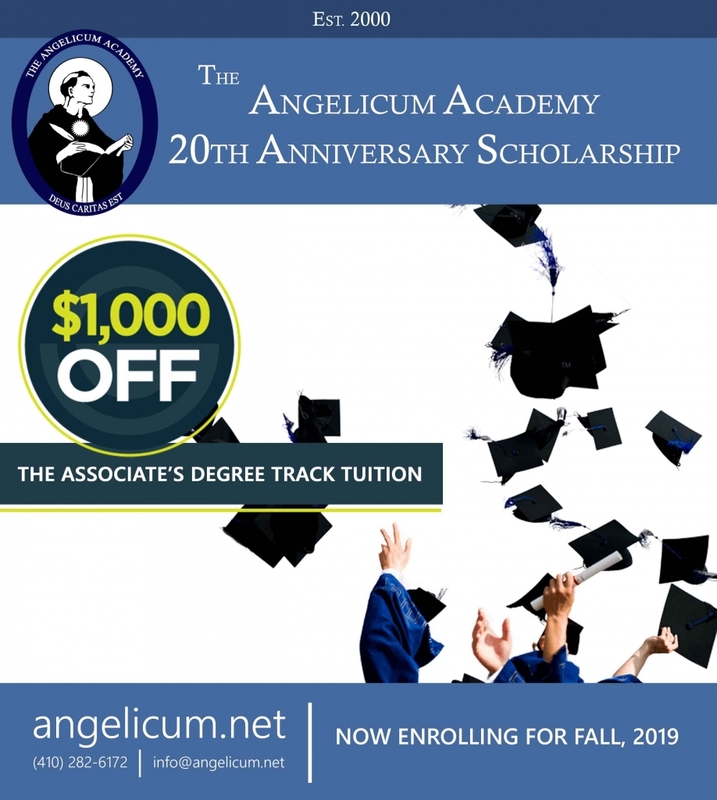 Rather than resume that pricing for 2019-2000 as planned we have decided to offer the following scholarship in honor of our 20th Anniversary Academic Year. $1,000 Scholarship Rules: To earn this scholarship, and lock it in for four years, all applicants must do is complete a 500 word (12 point, double spaced) essay on the topic of THE IMPORTANCE OF A CATHOLIC EDUCATION within two weeks of enrollment, and grant the Academy the right to post the essay online. The Academy may request the student to revise the essay for posting (see link below for essay help). That done, the $1,000 tuition reduction described above will be locked in* for that student as long as they are in the program, for up to four years, even if the regular tuition of $15,000 is otherwise resumed. Discounts. The 2019-2000 early enrollment discount (5% in April; 3% in May) and the annual payment-in-full discount (5%) may both be applied to the $3,500 Scholarship-reduced tuition, for those additional discounts, subject to those terms. * this total is locked in for students, and only subject to change if Holy Apostles College increases its tuition during the next four years, and only inasmuch as any such tuition increase affects Angelicum Academy students’ tuition for Holy Apostles College courses. Students already enrolled in the Associates degree program for 2019-2000 will have their tuition locked in for that academic year at the amount effective at the time of their enrollment.